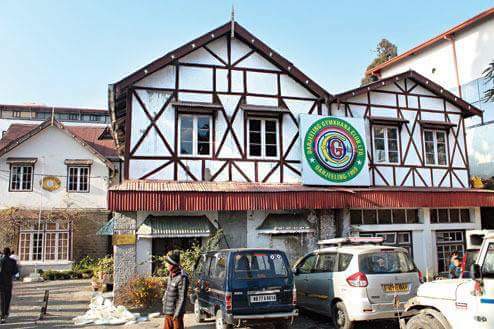 Trinamul leaders have alleged that Bimal Gurung, the Gorkha Janmukti Morcha chief, has interfered in the running of the prestigious Darjeeling Gymkhana Club where the election of executive committee is pending since September 2016. The allegation, which Gurung has denied, has come at a time both Trinamul and the Morcha are gearing up for civic and GTA elections scheduled to be held this year. N.B. Khawash, the spokesman for the Trinamul (hills), said: "The Gorkha Janmukti Morcha alleges that the state government interferes (in the functioning of the GTA). However, elections have not been held at the Gymkhana Club for sometime now because of the interference by the GJM. The message comes from Patlebas (the Morcha headquarters). It says (to the club members) Daju (Bimal Gurung) has said that elections should not be held and the polls get deferred." Gurung is called Daju - a term of respect for an elder brother - by many of his supporters. The club, which was established in 1909 and whose president is the governor of Bengal, was to hold elections after the one-year term of the executive committee expired on September 30, 2016. The governor is not involved in the running of the club as he is the ex-officio president.The affairs of the club are managed by the 14-member executive committee that elects the chairman and the vice-chairman. Khawash asked: "Why is the GJM interfering in the functioning of an independent club. What is the interest? Is it because of the land?" The Darjeeling Gymkhana is spread over two acres and a hotel has come up on the club's premises, while another is under construction. One of Darjeeling's most famous addresses, the club has around 450 members from across India. "Life-time membership fee for people from the Darjeeling district is around Rs 2 lakh, while for the rest, it is around Rs 4 lakh," said a source. The club has a health club and facilities for tennis, badminton, table tennis and squash. Asked about the charge levelled by Trinamul, Gurung said: "The executive committee has to decide whether elections should be held or not." He added: "The Gymkhana is an old club and an asset of Darjeeling and it should not go to wrong people. The club should be properly managed. We just want that the property should not go into the hands of the wrong people. We never wanted to interfere in the Gymkhana or manage its affairs. But the Gymkhana has to survive for tomorrow." The Morcha chief instead questioned Trinamul for raising the issue. "Trinamul should first answer why it does not want to hold elections to hill municipalities. Instead, they have put the subdivisional officers (as administrators) there." Dinesh Chandra Rai, the chairman of the club, denied that the Morcha was interfering in the club's functioning and said the elections would be held in March. "The allegations are wrong. We could not hold elections because of unavoidable circumstances. There is no interference. The AGM will be held shortly," said Rai. Asked about the "unavoidable circumstances", Rai said: "Internal matters of the club cannot be disclosed." Locals are however perplexed at the misplaced priorities of TMC leaders, a youth said, "TMC seems to be more worried about elections in a private club, instead of Municipal and Panchayat elections... this just shows how out of touch they are with the realities of Darjeeling... if they want to demand elections, why not demand conducting of Municipal elections, our people are suffering and yet they are not concerned, but they are concerned about a private club..."